The Cut Bar is one of London's most popular theatre bars and restaurants. Set within the Young Vic’s award winning building and minutes from Tate Modern, Old Vic Theatre, Southbank and Southwark and Waterloo Stations. 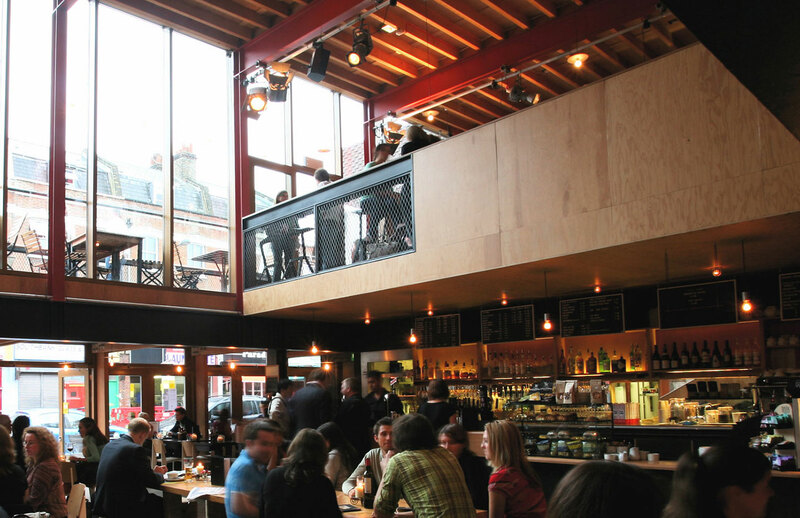 Over two floors the stylish, buzzy bar and open-air terrace host an eclectic crowd of theatregoers, artists, suits and locals. Attentive, friendly service and good food and wine. Someone at the table next to us was speaking loudly on her phone (for an hour) which was very distracting! Maybe the tables could be more spaced out, or people could be politely asked to go outside if they are going to have a long telephone conversation. Food wasn't the best and shame you don't serve Guinness on the tap but the service and the ambiance made up for it. I have never experienced such genuine care and friendly attention from a theatre bar/cafe before. I must say that each member of staff were warm, friendly and welcoming. I felt at ease immediately. Was disappointed on this visit. The menu no longer has any offers and there seems to be less choice. It also has not changed at all over the last 2 years. The service and staff are very good. But you do need to sort out the menu!! Helpful staff, delicious, inexpensive food and fantastic value cocktails - definitely recommend the blood orange negroni. Will be back! Thanks for looking after us. Particularly since we were 10 rather than 9 as reserved. We’ve been coming to the restaurant pre-theatre for at least 8 years, and your team always look after us exceptionally well. I’ve been a few times for drinks and nibbles and found it great every time. Food is delicious and the atmosphere is good. Make sure to book as it can get very busy pre- /during the theatre hours! Very average food. Barely hot by the time it reached the table. Not enough staff. Hi - service was inattentive. The meat and cheese platter was not very good. The cheese was particularly rubbery and tasteless . The bread mediocre and salami cheap. It tasted and looked like something that used to be served LONDON 15 years ago. Come team surely you can do better than this ? Your menu is not very extensive! Dinner in the restaurant made the show even better! We ate at The Cut before seeing a performance at the Young Vic. The menu offers a good variety of food. Food was tasty and service friendly. I would eat here again. We love the Cut. It feels like a favorite neighborhood restaurant. Service is friendly, personal, and efficient. Food  is tasty and fresh. Great for before the Young and Old Vic and National Theater but also good for a reasonably priced night out. The sticky pudding was lacking sauce. But this was amended on asking. We were given the dessert on the house as way of an apology! I have been hosting networking events with you for a couple of years now and everyone has a great time - it's why I keep repeating my bookings every quarter. Thanks so much for always having us and being so fab. Young Vic is a joy. I love the way you dare to be different from the other major London  theatres. And I love the buzz of youth, as opposed to the quiet middle-agedness of most of the others. Great food, wait staff need to know more about the cocktails.